Let’s suppose your sales department has three members and each one is assigned to several client accounts. You most probably do not want all of them to have access to the business’s full financial data. 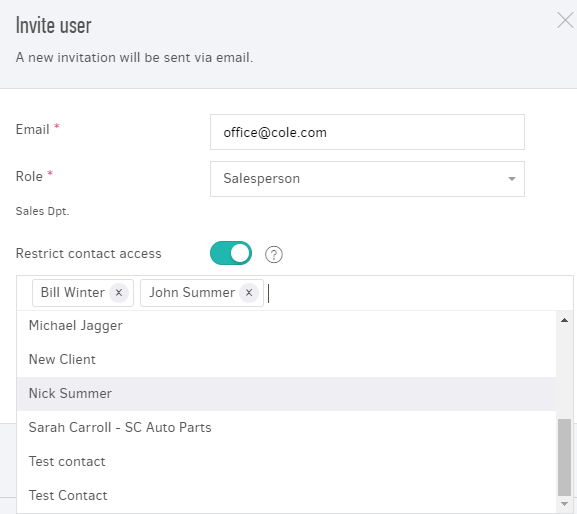 You can restrict any user account to only view the data of specific contacts. Access only the invoices of the assigned contacts. All other invoices will be invisible. The same goes with credit notes, estimates etc, with respect to the role permissions. All reports and dashboard indices, are modified to reflect the data of the allowed contacts. E.g. your monthly sales are 20,000$ and you, 4,000$ of which originate from Client A. Once you log in as manager, Elorus will show a total 20k monthly sales in the dashboard. If an employee that is restricted to access Contact A’s data logs in, the dashboard will show a total of 4,000$ monthly sales. 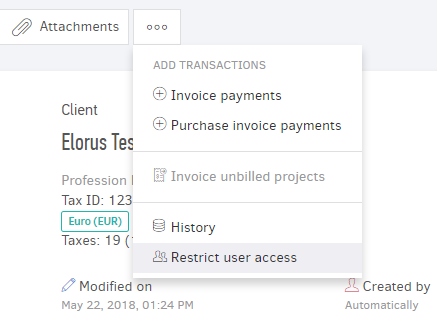 When creating or editing a user by enabling the "Restrict contact access" option. 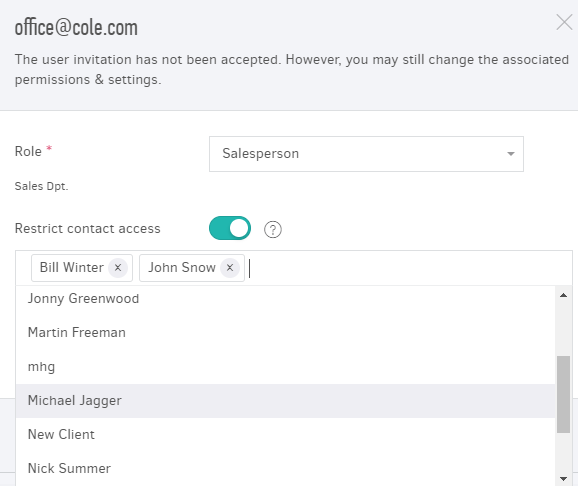 In the field that opens, type the contacts you want to assign to the user. From the Contacts menu, choose each contact you want to assign to a user and click on the more options icon (...). The "Restricted contact access" option should be already enable from the user! There, select the "Restrict user access" option. In this field, you can select one or more users who will have access to the data and the transactions of each contact. Users with restricted contact access, are not allowed to add new contacts, even if the corresponding role grants the “add contact” permission. Imagine the following scenario: A user with restricted access adds a new contact, creates and sends an invoice. However, the contact already exists in the account, it’s just that he was not able to see it. Now, the organization has duplicate contacts and the client statement is inaccurate. You cannot restrict contact access to manager users.